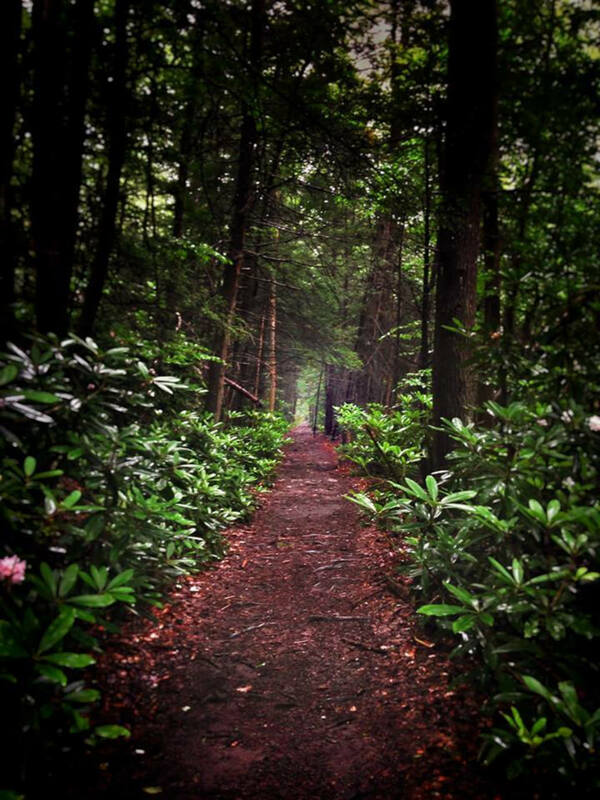 A trail tunnels through the think canopy of Cathedral State Park. 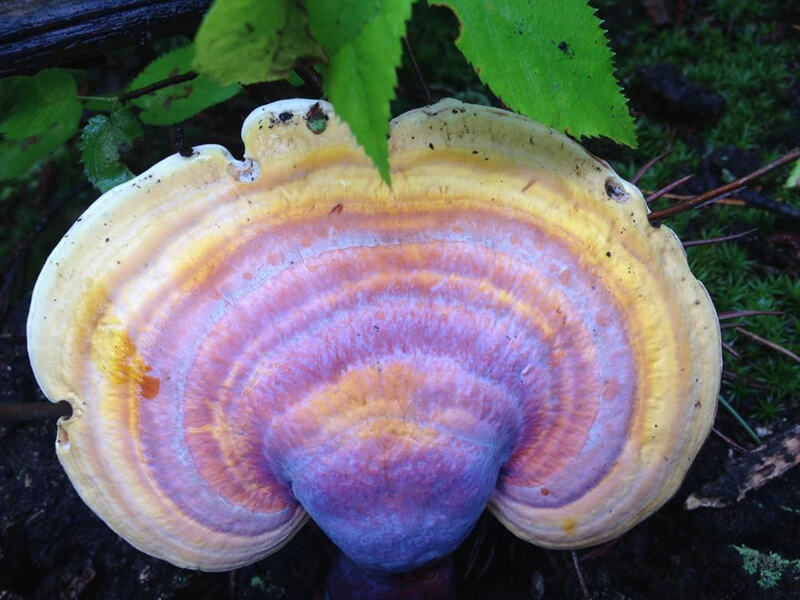 One of the many fungi on display in Cathedral State Park. The sign marking the entrance to the park on US Route 50. This Natural National Landmark will thrill nature lovers, since it’s the largest remaining virgin timber tract in West Virginia, and has an ancient hemlock grove with trees up to 90 feet tall and 21 feet around. The longest individual trail clocks in at just longer than 1.1 miles, with connectors and other loops offering 6 total miles of trails. The park is nestled in a relatively flat tract of land with elevation ranging from 2,460 to 2,620 feet. Soft forest floor trails and wooden bridges make for easy hiking with few obstacles to contend with. At even a slow pace, a linkup of all trails shouldn't take more than an hour. Considering Cathedral's location right along US Route 50, a quick jaunt through the the towering hemlocks could offer a welcome respite from the cramped confines of your car. If you're short on time, the Giant Hemlock Trail or the Wood Thrush Trail - both accessible from the main Cathedral Trail artery - will provide a good immersion in under 30 minutes. Cathedral is an easily accessible place to view the splendor of Appalachia's endangered hemlock stands year round. Road conditions in winter can vary, but the park stays open and is gorgeous in fresh snowfall. Trails are likely to be wet or muddy during winter and following rain in spring and summer. All West Virginia state parks require dogs to be on leashes no longer than 10 feet. The sunlight filters through the thick emerald canopy, casting a soothing yellow ambiance that calmly illuminates ferns and mosses, as your feet step softly along a winding forest floor. Although that statement may sound like something out of a fairy tale, this transcendental experience is easily within reach at Cathedral State Park. 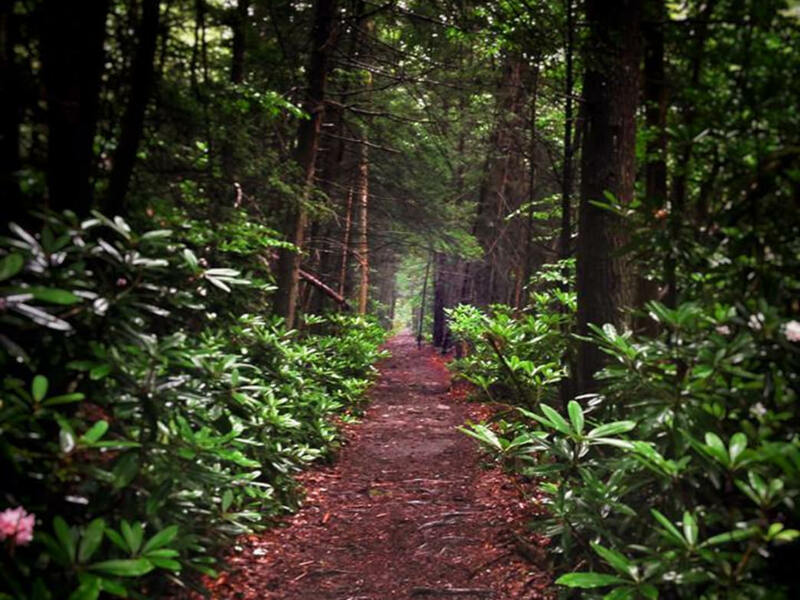 6 miles of pleasant trails meander through 133 acres of virgin hemlock forest, giving you a close and personal encounter with an untrammeled ecosystem. 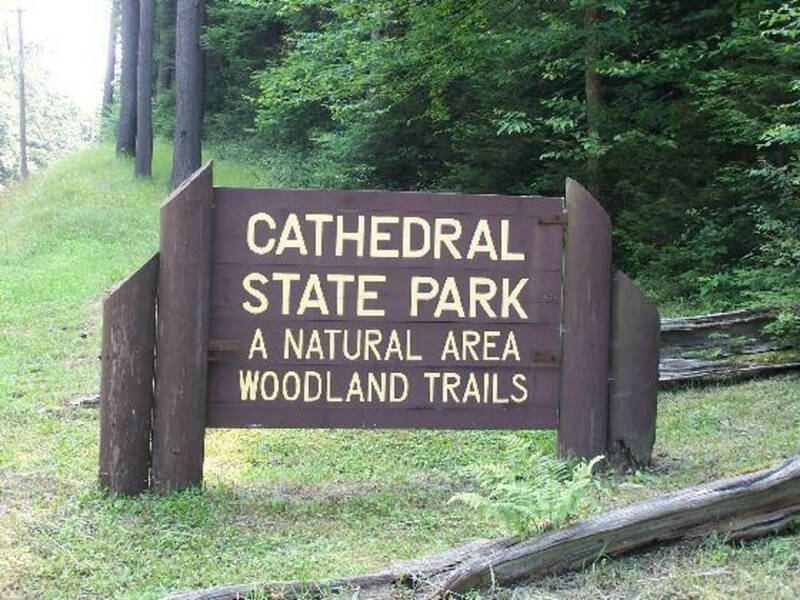 Cathedral State Park’s finest superlative is its status as the largest remaining virgin timber tract in West Virginia. Traversing the rich biological diversity of an ecosystem that exists as it has since its formation is a profound (and rare) experience that visitors of all ages can appreciate. The park’s stately eastern hemlocks grow up to 90 feet tall and 21 feet around. The rich shade-tolerant ecosystem that thrives in the deep humus soil grows more than 170 species of vascular flora, including 9 types of fern and more than 50 wildflowers. The Rhine Creek bisects the forest, creating a picturesque woodland scenery that photographers will love. The sound-dampening qualities of the forest will make you forget that you’re right off US Route 50 and within a day’s drive of several metropolitan areas. While the surrounding Allegheny Mountains are steep and rugged, Cathedral State Park is nestled in a relatively flat and fertile valley—elevation in the park ranges from 2,460 to 2,620 feet. This makes the park’s 6 miles of looping and connecting trails highly accessible for folks of all ages and fitness levels. You can also see natural processes of forest succession and destruction. In October 2014, lightning strikes toppled the centennial hemlock—the state’s largest. An interpretive observation deck wraps around its 20-foot stump. Cathedral State Park is pleasantly surprising. If you are just looking to peacefully stretch your legs or you’re a well-read naturalist, the magical hemlock forest has something for everyone. Photographers will appreciate the park’s camera-friendly lighting year-round. Given the ease and accessibility of the trail system, the park is very family friendly and easy on the legs. Cathedral State Park is directly along US Route 50 about 1 mile east of Aurora, WV and 5 miles west of Red House, MD. You can park by the headquarters. The park is open year-round. Check Route 50 road conditions. There are no fees for the park or picnic shelters. Dogs have to be kept on a leash no longer than 10 feet.